So, what do these symbols mean? 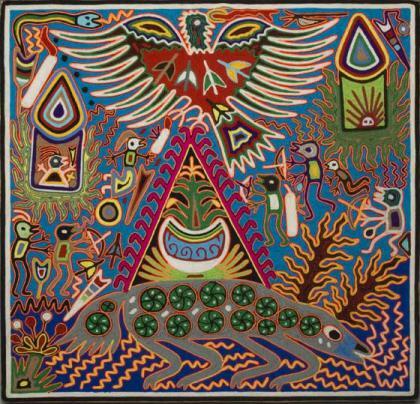 The Huichol (WEE-chol) Indians of western Mexico create rich, vibrant paintings out of yarn. Colorful and imaginative, the works contain important religious symbols-sun, corn, deer, birds, shamans and serpents-that describe the cycles of life. To make a painting, the artist first determines the size of the piece and cuts a wood base. The base is sanded, polished and coated with beeswax. The artist traces his design in the sticky wax, and lightly applies the brightly colored yarn. The Huichol developed yarn painting in the early 1960s specifically as items to sell to tourists. The style, technique and imagery evolved from earlier, traditional folk arts made for religious purposes. Artists can only work at certain times of day. If the weather is too hot, the wax will melt. If it's too cold, the wax won't be sticky enough to hold the yarn.